That's the quote on the locker room door at the new gym I joined. 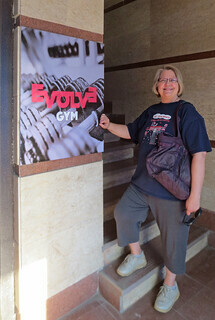 While out for a walk around the neighborhood I spotted a new gym named Evolve, just a half mile from our condo. I thought I'd go there one day and check it out. As luck would have it, before I returned home, I met a neighbor walking to that very gym so I turned around and walked back to the gym with her. 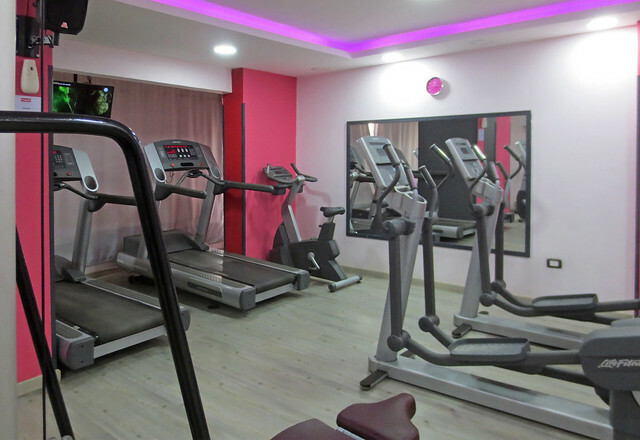 The women's floor has the modesty drapes so that all women can safely exercise without being seen. There is a men's zone and a separate ladies' zone. 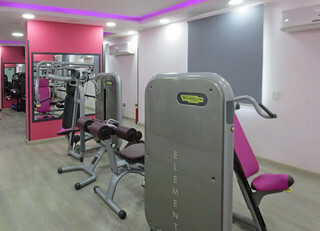 I had a tour of the ladies' floor which included a workout area, an aerobics class room, the jaccuzzi and the locker room. I also met the two trainers. Everything was sparkling new and clean and all the ladies were friendly. A couple days later I returned with my $47 and paid for a 3 month membership. I go 3-5 times a week depending on my other activities. 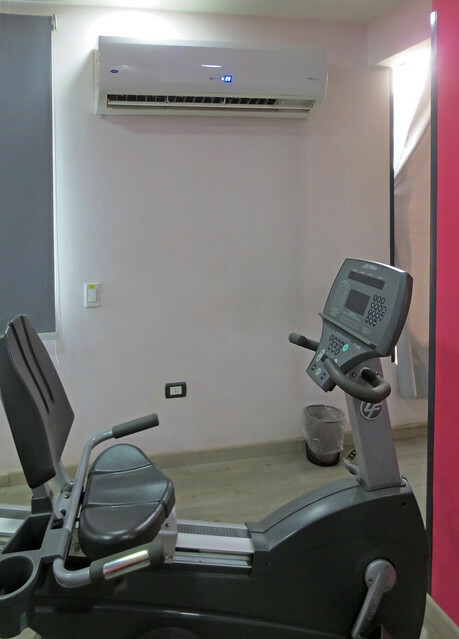 I walk on the treadmill and use the stationary bike before working on the machines under the instruction of a trainer. The trainers don't compare to my LifeTime trainer but I feel good getting some regular exercise. While touring I neglected to note whether or not there was any AC unit. There are several but it's winter, after all, so they are not in use. After walking on the treadmill for a half hour I was dripping. I asked if the AC could be turned on and they happily complied with my wish. We moved the bike directly in the flow of the air and then the trainer turned the temp down to 77(25 degrees C) That's right, down. I've since convinced them to turn it down to 73.5 (23) so now I bike while cooling down from my walk. 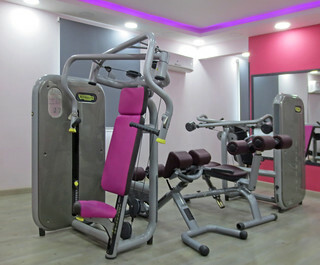 Walking to and from the gym combined with an hour and a half on various machines gives me a very satisfactory work out. 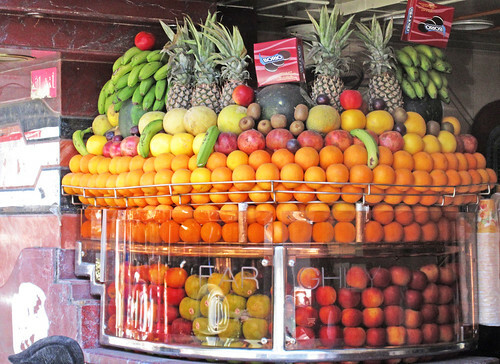 Street food in Egypt takes many forms, but among the most popular are the nut shops and juice stands. 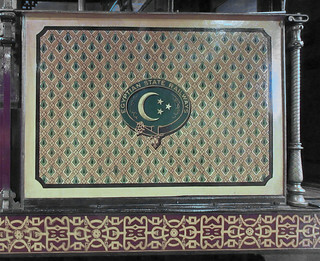 On a busy avenue such as Pyramids or Faisal, you can find these on almost every block. 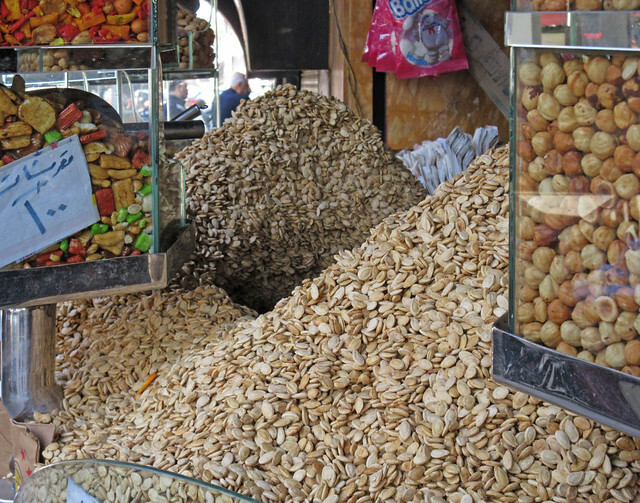 Peanuts and pistachios are widely available, but we were interested in almonds and cashews and maybe some pecans? 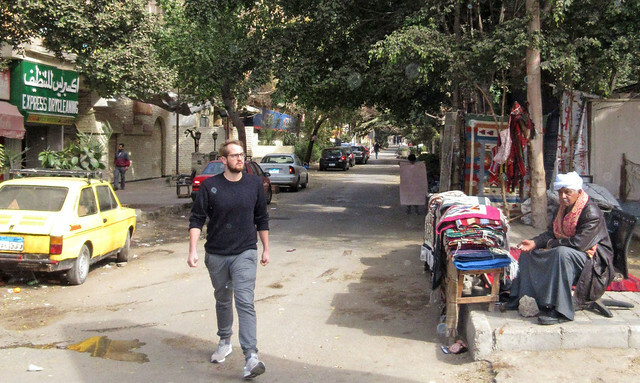 We headed over to Dokki, an upper-middle class neighborhood between Cairo University and the river Nile. This nut store always has a line of people waiting to buy. 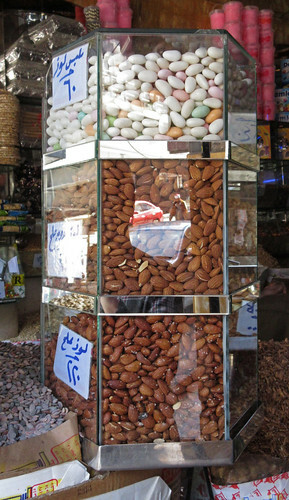 There are a few varieties of "salty mix" but most people are just buying snack size packages of nuts. 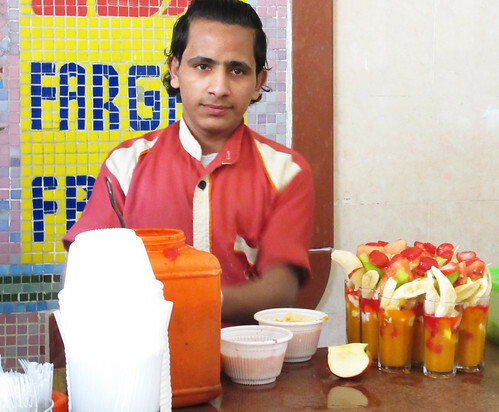 Next door is a juice stand that makes one of the world's great fruit cocktails. 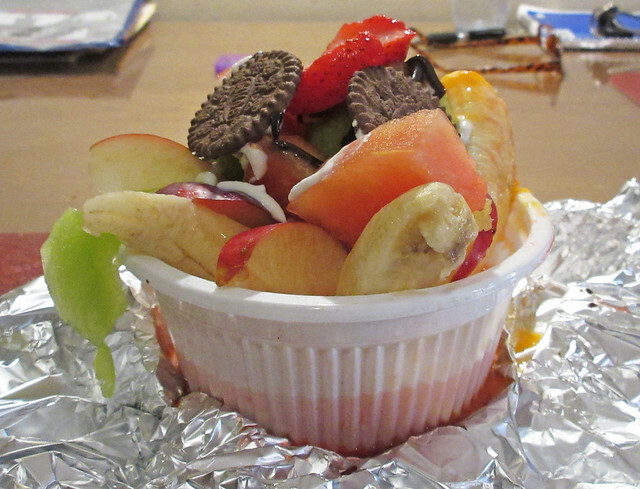 We ordered ours for "take away" so a generous wrapping of foil was placed around each one to prevent spillage. 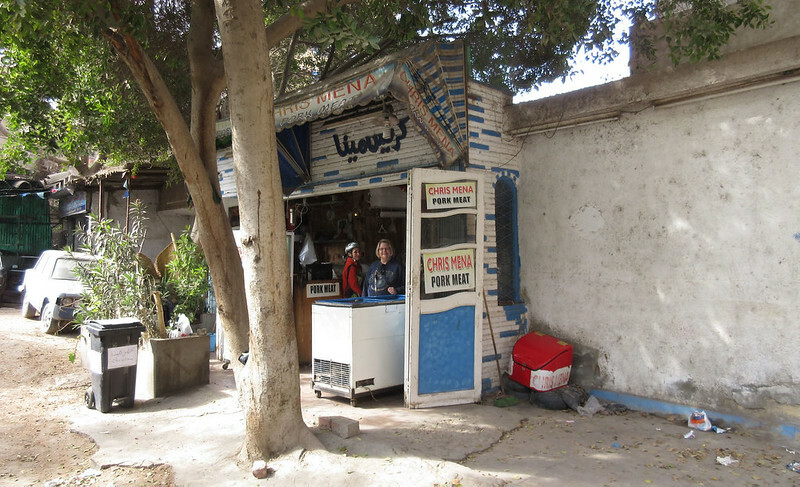 On Friday morning we headed across the river to Maadi, the center of western culture in Cairo. 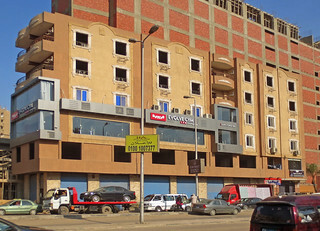 Maadi has a long history as the center of the ex-pat community. 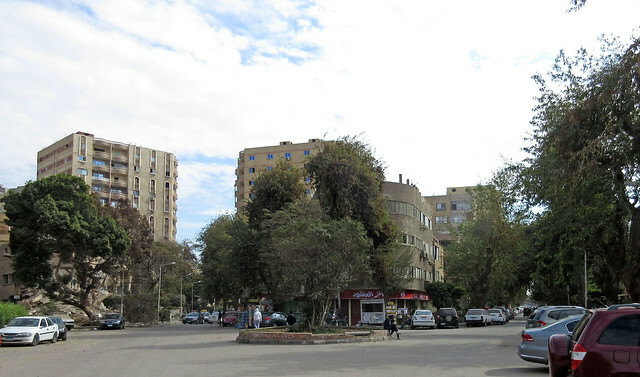 The appearance of this district is very distinct with tree-lined streets and squares and a much slower pace of traffic. Many people describe it as havng a European look and you are as likely as not going to see other westerners on every block. We were on a mission to buy some pork at a local butcher-shop. 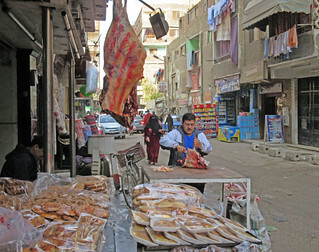 There is no pork to be found in any supermarket or restaurant in nearly all parts of Cairo. There is bacon on the pizza and bacon on the burgers at Chili's - but it is beef bacon. 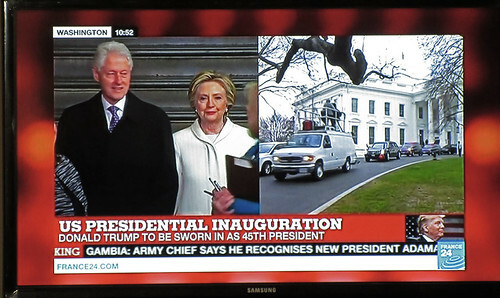 OK, but not the same as we are used to. Pork is available either in the Christian area or here in Maadi where the ex-pats live. 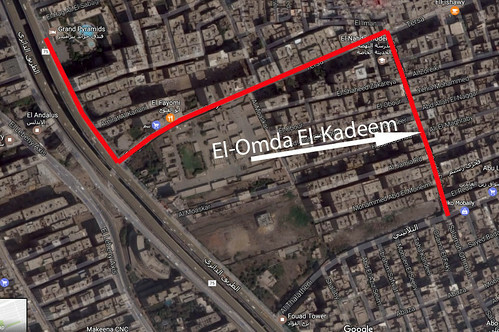 If you ever wondered whether U. S. State Department employees truly live in a bubble, I suggest you read this blog post written by a State Department employee living in Maadi. We have purchased imported pork at a German shop in Maadi in the past but wanted to also sample the local product. We got directions to a shop from our acquaintance, Maryanne Stroud, after spotting a ham sandwich on her Facebook page. "... on Road 9, go past Cheers, then look to the right down the alley." Cheers is one of the local liquor stores and here you can see one of the staff opening the door to show me in. We had arrived at a particularly bad time - during Friday noon prayers - for buying liquor and the doors were deferentially closed for a while. But don't worry, "Come, come ..." said the gentleman in the Cheers jacket. Around the corner we spotted the sign for Chris Mena Pork Shop. "Informal" probably best describes the atmosphere. A French lady who had arrived by bicycle was making a purchase as Linda checked out the selection of fresh and frozen items in the freezers on the alley. 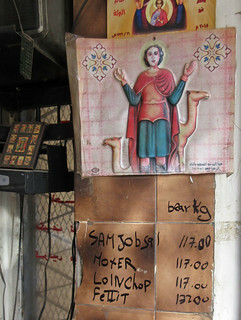 Prices are clearly marked on the sign - and you can see it is a Christian shop as well. Your guess is as good as mine about what "Moxer" is. 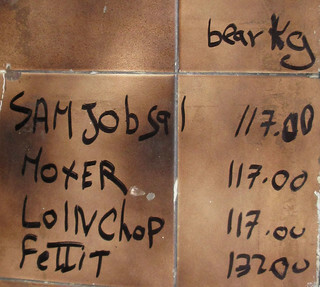 I can, however, explain "Bear kg." The letters "B" and "P" are relatively interchangeable since they are pronounced the same. The intent is to say "per kg." Our late afternoon meal consisted of ham sandwiches and potato soup with bacon. 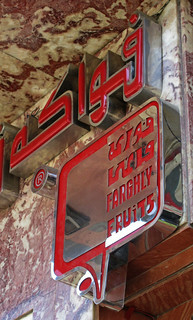 Chris Mena's can be found in Maadi on the west side of Road 9 between Street 75 and Street 76. (It is on Google Maps.) Don't expect anyone there to recognize those street names or that you will find a sign. Besides Cheers, there is a corner grocery store on the east side of the street a bit farther south with a good looking selection of wines. Good luck. 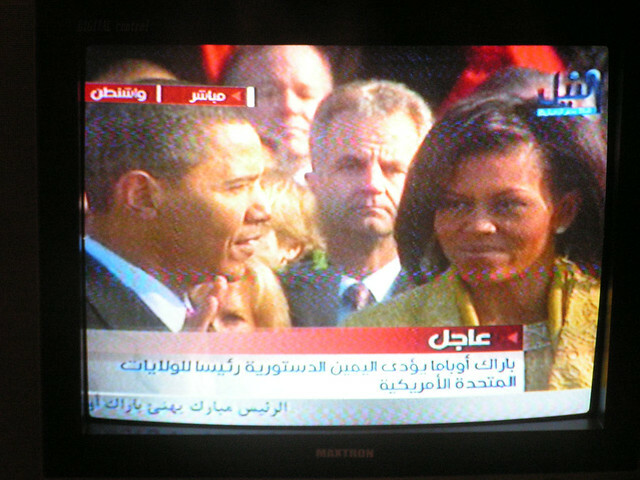 The presidential inauguration took place at 7:00 p.m., Cairo time on a Friday evening making it in prime-time viewing. This caused some conflict in households with only one TV since there was a football match on at the same time. Dad won that conflict in one family that we know. 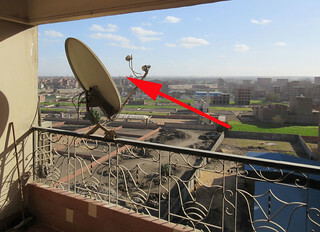 Eight years ago, we had not quite installed our satellite dish when Inauguration Day rolled around and we had to watch the Obama ceremony from a Nile TV broadcast over the air and in standard definition. You can review that post here. 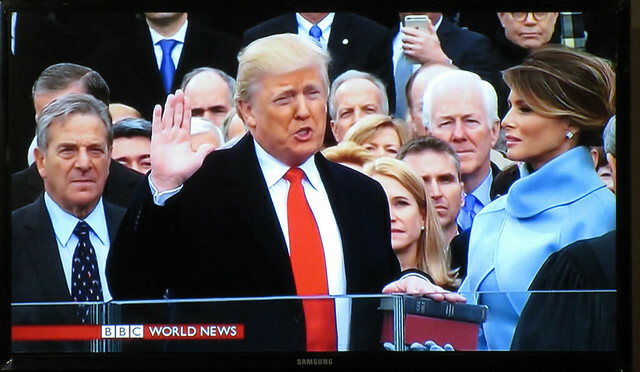 This year, we had a choice of several channels. Nile TV, BBC, CNN-International, French 24, RT (Russian) All had coverage as I scanned the news channels group on our dish receiver. All but Nile TV were offering English commentary. CCTV (Chinese Central television) appeared to be ignoring the event, in conformance to gov't wishes. We settled on the BBC. As always, there is much interest in American politics in Cairo with the usual question being a cautious, "What about Trump?" from cab drivers and merchants who find themselves talking to Americans. U.S. demonstrations and protests get wide coverage here. When I stopped at the bakery this morning, my friend behind the counter suggested that I was probably glad to be in Cairo and not back in the states today! It's all in your perspective where it's safe to be. Many Egyptians were particularly happy to catch a glimpse of former President Carter who is still held in high regard by those old enough to recall his term in office. We had been here for just over a week when the doorbell rang after dinner. It was the "electric man." I don't know exactly how the system works, but he is one of the first to discover when we are back in town. He knows the least English of anyone we are in contact with here. He hands me a set of monthly bills produced by his hand-held computer and says something in Arabic that apparently means, "You are overdue on electricity!" When I ask for the total, he says 159 in Arabic. 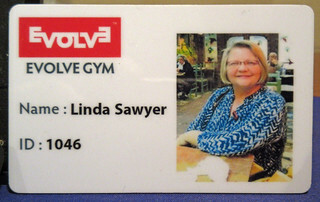 I summon Linda to translate. 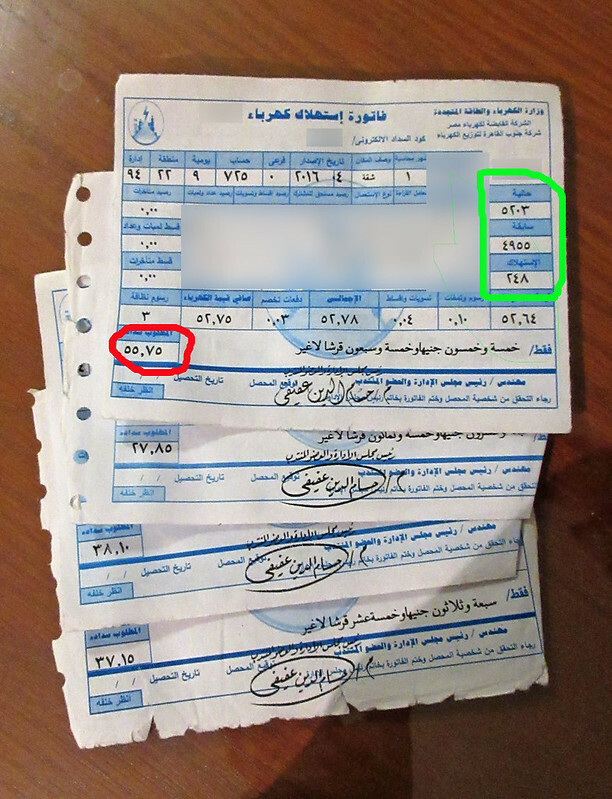 I fish out 160 Egyptian pounds and pay up in exchange for the receipts. The actual total is 158.85 but everyone rounds up here - and I tell him to keep the 1 pound in change. He smiles and is gone for another month or two. The electric bills are fairly simple to understand once you catch on to reading from right to left instead of left to right. The column on the right, circled in green, holds the current and previous meter readings and the calculated usage. Below that is the fee for electricity; various taxes, fees and the like that are then added and subtracted which raise the amount by around twenty cents. The total is circled in red on the left. Our bottom line electric charge for the past 11 months was $9.34 which added to our bill paid last February brought the total annual bill to about $23.50. Next was the Condominium Association fees. My neighbor, Mohamed, knocked on our door last night to see if I recalled when I last paid. 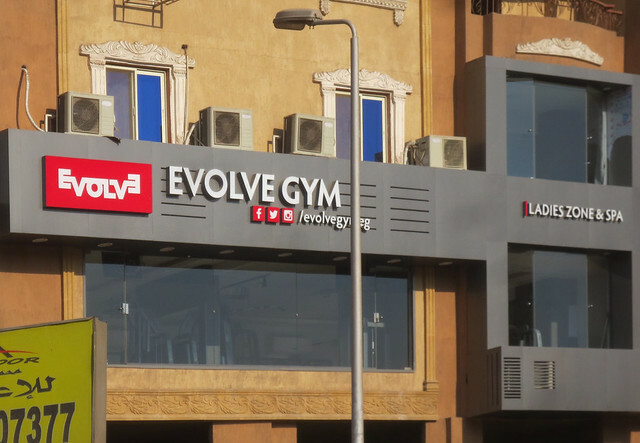 We pay 100 Egyptian pounds per month which covers the water, the elevator and the lights in the common area - and, oh yes, the services of Sayed, our bawaab. Mrs. Sayed is outside our door as I write this, mopping the floor. They do this once a week. This year we had an extra thousand pound assessment for elevator repairs which included new cables as the old ones were getting worn. I am glad Mohammed is in charge. He doesn't scrimp on the maintenance as I am sure others might. That put our annual total at 2200 EGP, or about $129. So there you have our living expenses. Something under $180 for the year. We took a taxi up to the supermarket and back this morning for a dollar each way. I picked up a pound of fresh local bananas and two pounds of tangerines for another dollar, from a "green grocer" just down the block. The temperature is 66 and the sun is shining. Life is good. 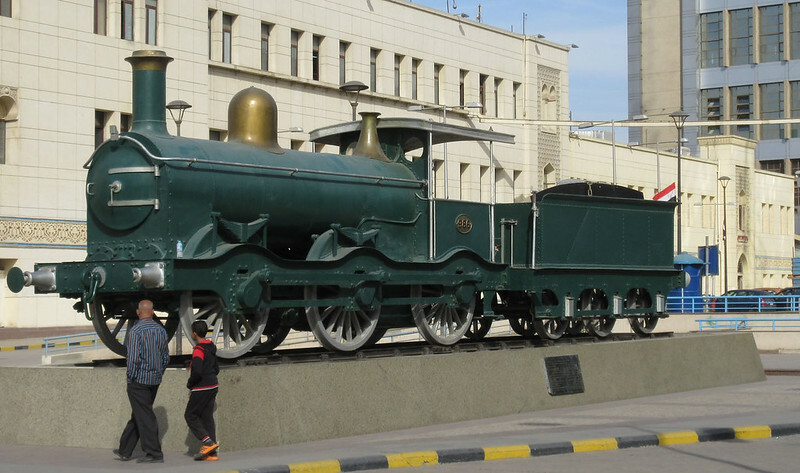 Yesterday, we headed downtown to Ramses Station to visit the Egyptian Railways Museum. We heard that it was finally open and we thought it wise to get there soon. 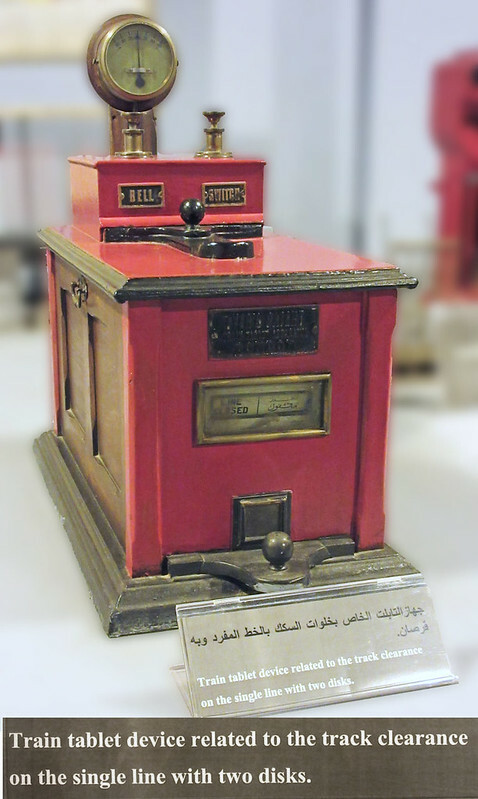 I have blogged about the Railways Museum and Ramses Station in previous years so I will concentrate on the museum content this time. Follow those links if you want to see more. I noticed that old number "986" outside the museum has received a new paint job since our last visit. 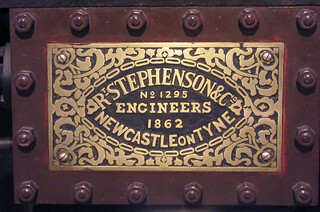 This locomotive dates from 1865. There are two floors to the museum and a wide variety of transportation exhibits. 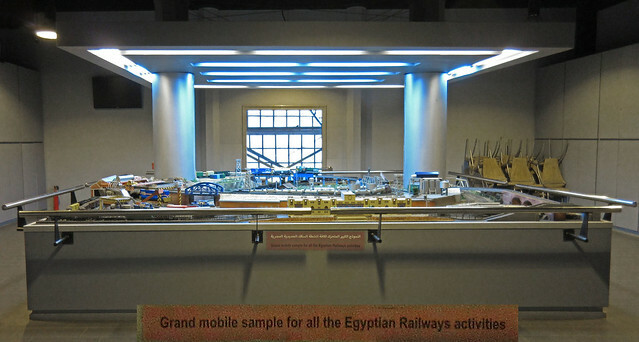 The original museum was established in 1933 when Cairo hosted the International Railway Congress. 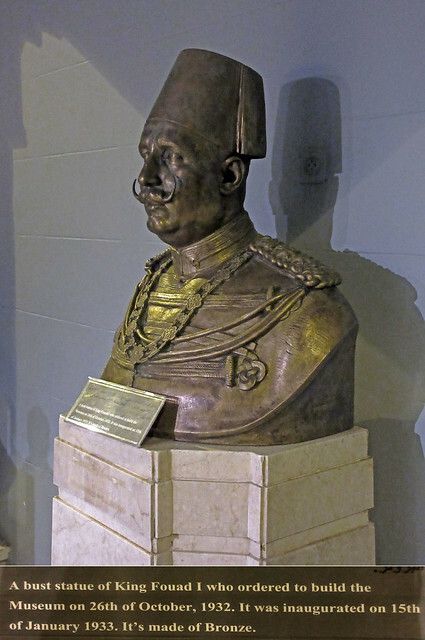 King Fouad directed the building of the museum, so naturally there is a large bronze bust of him inside. King Fouad shows up in a lot of museums here. 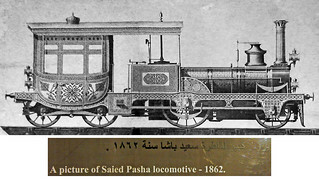 The major historic holding of the museum is the 1862 Saied Pasha locomotive built in England by the Robert Stephenson & Co. There are a number of items of railway equipment, although the labeling is a bit confusing. This model represents one of the planes which are used for transporting for long distance, old type. It turns out that the "Horsa" is a British Handley Page HP 42. There were only four of them built, all around 1931, and they were named the Hannibal, the Horsa, the Hana and the Hadrian. Imperial Airlines used the Horsa on the Cairo to Pakistan leg of their flights from England to Australia. What did we ever do before Google and Wikipedia? At the conclusion of the visit, we ended up on the second floor at a large model railroad layout. 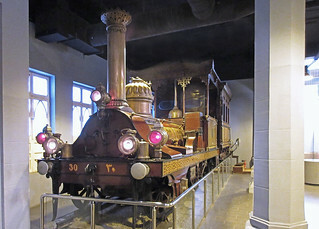 As I looked it over, the museum director came by, turned on the lights and started up the trains and equipment. I recorded a few seconds of that and put it onto YouTube. 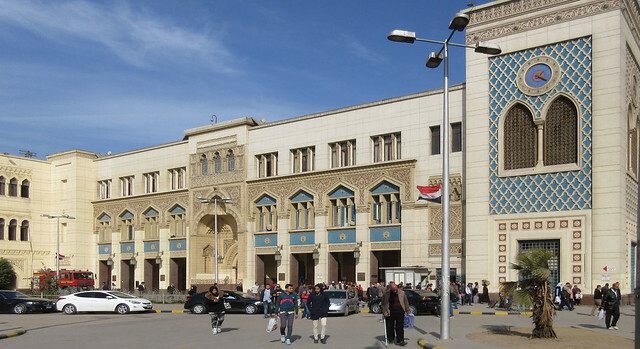 This museum is not one of the most exciting exhibits in Cairo but if you've seen all the other museums or have a serious interest in trains and transportation then you may want to consider a visit. 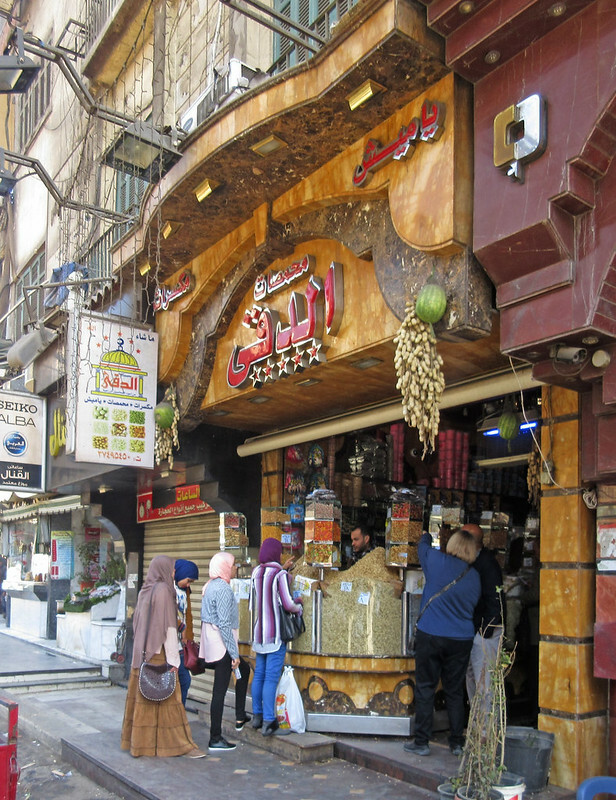 One of our favorite activities for early Friday afternoon is to walk a nearby market street, El-Omda El-Kadeem. We leave the apartment around 1 p.m., just as the noon prayers are finishing in the many small mosques in the neighborhood. The men and their sons are leaving to return home where the women and daughters are preparing a big afternoon meal. The fragrance of garlic and fresh herbs cooking wafts out of the apartments and onto the streets as we pass by. Along the market street, quite a few men will stop to pick up freshly baked bread loaves dropping out of the band-ovens to bring home for the meal. There are at least six bakeries along the quarter mile length of the street and I will stop at the last of them to pick up some dessert sweets. We particularly enjoy this walk because it is so typical of local life and is just a few blocks way from the ring road and busloads of tourists stopping at the papyrus and perfume shops included on their day's agenda. 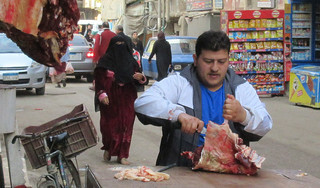 Linda took a picture of a butcher at work while I was in the adjacent bakery. I picked up three good-sized sweet-rolls for 1 EGP each (about six cents each) and, of course, the shop owner offered them to me for free ("Welcome in Egypt!") but I paid. 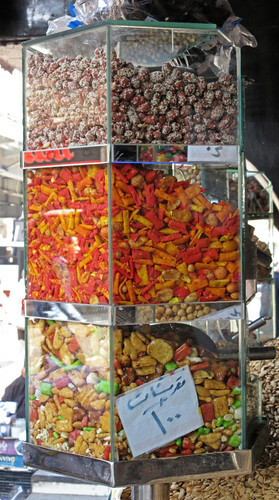 Across the narrow street, a fruit stand offered the usual assortment with fresh strawberries and dates featured in the front. 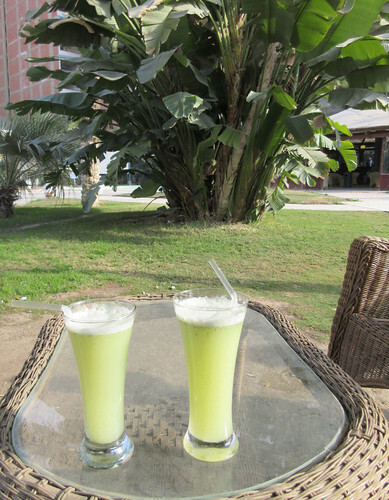 It is about a half mile from the end of the market street to the Grand Pyramids Hotel where we traditionally stop by the pool for a glass of freshly squeezed lemonade. The Grand Pyramids is somehow surviving the tourist slump in spite of having very few visitors. We saw only a single family on the grounds during our hour-long stay. 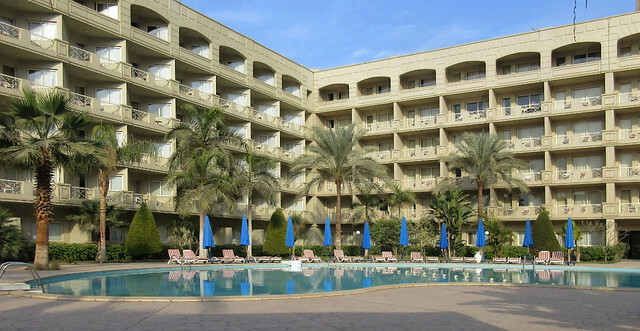 Larger tour groups, such as those from China, are booked into the five-star hotels and the adventurous younger couples now book into the growing number of boutique-hotels that are springing up in Mena Village immediately adjacent to the pyramids. Lemonade at the Grand Pyramids cost about two dollars for both, a real bargain by U.S. standards. 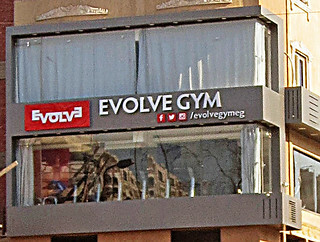 Yesterday we headed across the river to the City Center shopping mall in Maadi. We do this about once a month to stock up on food at low prices and buy items that are hard to find in the neighborhood. 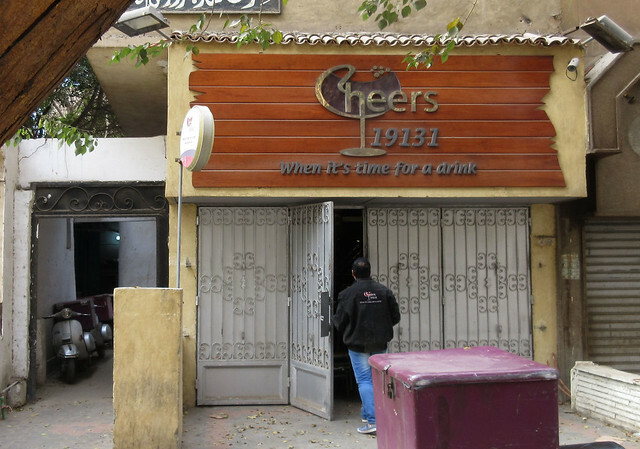 Maadi is the district of Cairo favored by diplomats and other ex-pats who don't want to immerse themselves too deeply into Egyptian life. 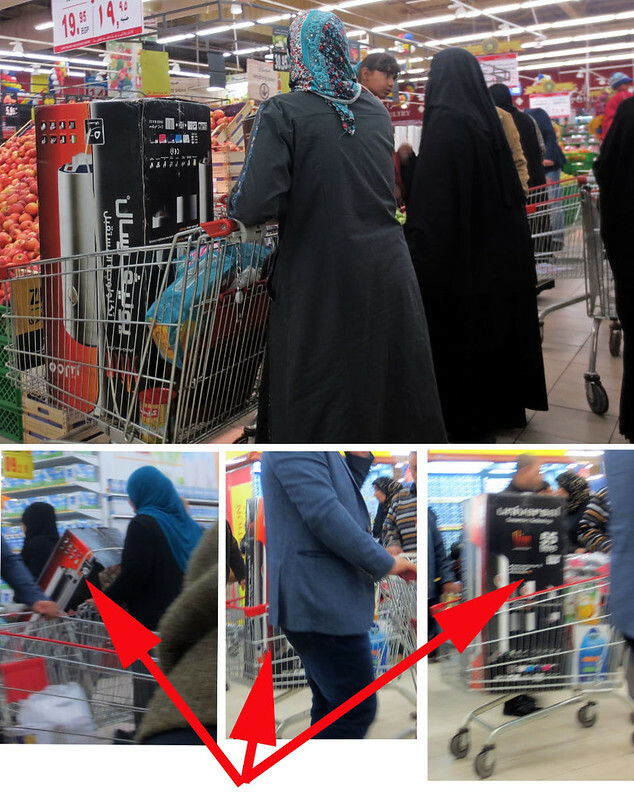 Carrefour, you may recall, is the giant French retailer second in size only to WalMart. The entire month of January is devoted to their annual Egyptian anniversary sale - this year being the fourteenth of these. The stores are crowded and we noticed security was enhanced as well. This local blogger covered the crowd scene quite well and you might want to follow the link to look at her pictures. The Carrefour anniversary flyer featured flat-screen TVs on the cover with the 40 inch sets going for about $230. There were quite a few of these that we saw going out the door in shopping carts while we lunched at Chili's restaurant near the mall entrance. 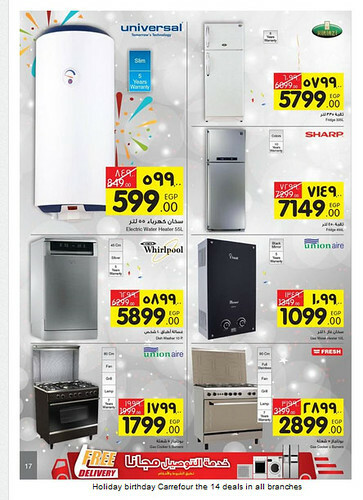 Electric water heaters. That 55 litre water heater was going into carts so fast that the merchanidsers couldn't get them out onto the floor. People were waiting by the stockroom door to grab them off the pallets as they came by. Here are four of them that I photographed in rapid succession in the vegetable section. Perhaps the $34 price was just to low to resist? 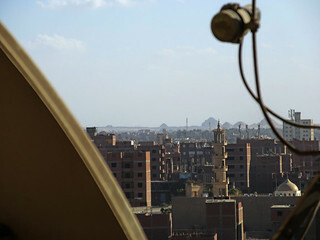 I was anxious to see the view from the rear balcony on our first morning in Cairo. The farmland is fast disappearing in this corner of the city. Here is the view from 2010. And today, there are small lots across the street just waiting for development. 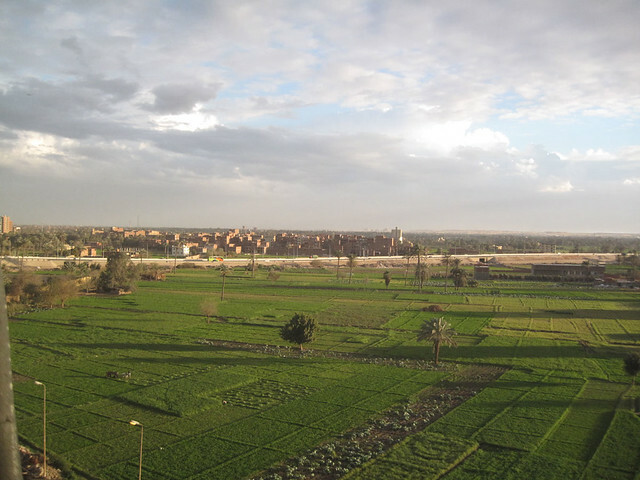 If you know where to look, the pyramids at Sakaara and Dashour are still visible. But soon they will likely be obscured by more apartments like these. You might notice that there are a lot of vacant apartments in those pictures. We are told that they are all owned. 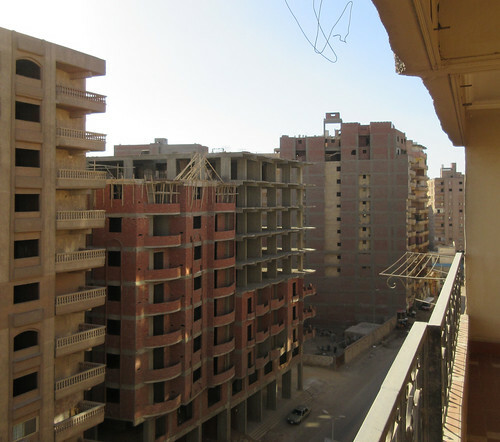 Real estate is a hedge against inflation and devaluation of the Egyptian Pound. 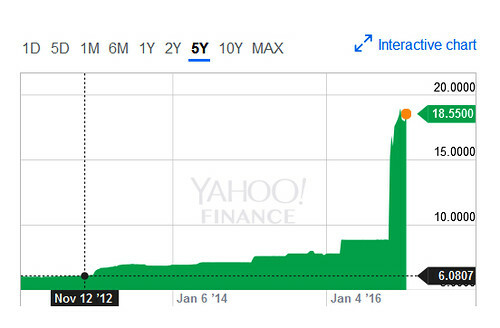 This five-year chart will show you why no one wants to be holding cash or bank notes. 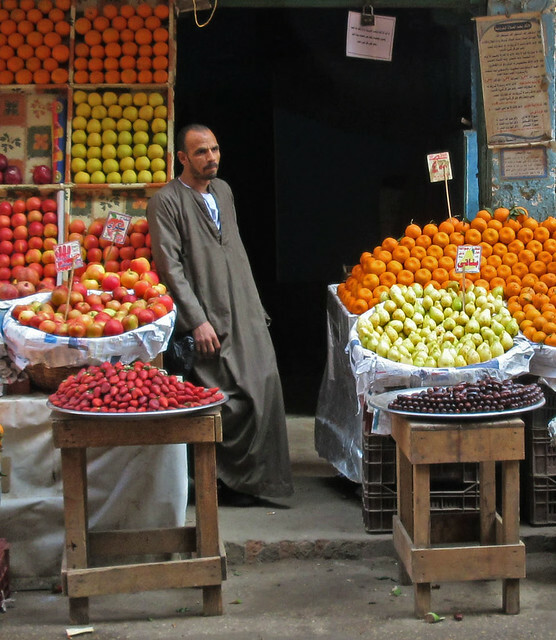 With the Egyptian Pound falling like a rock, bananas are now selling for 10 pounds to the kilo and strawberries twice that. These prices are about double what they were last year. 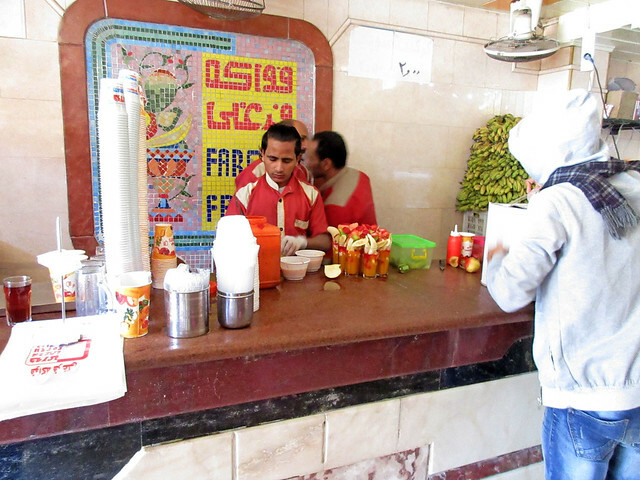 For us, that translates to 27 cents a pound for bananas and 54 cents a pound for fresh strawberries - still a bargain. Boneless chicken breasts are about $2 a pound - much better prices than in Florida, Arizona and Texas, where other snowbirds fly.. Many people here seem cautiously optimistic that the economy is on the right path. Increasing numbers of Chinese tourists are showing up and some say they are actually spending money - something they have never been accused of in the past!. 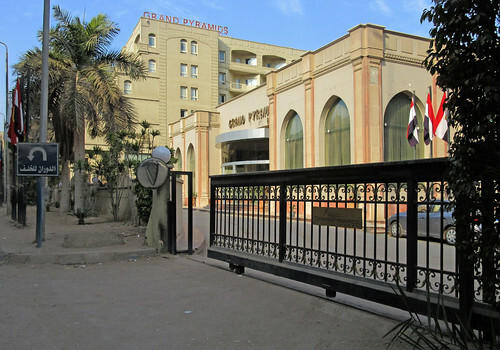 Egypt has begun accepting the Chinese Yuan as well. 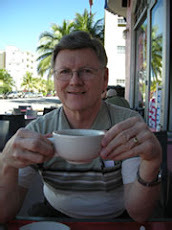 We even saw a busload of Americans yesterday, the first of those I have come across in some time.